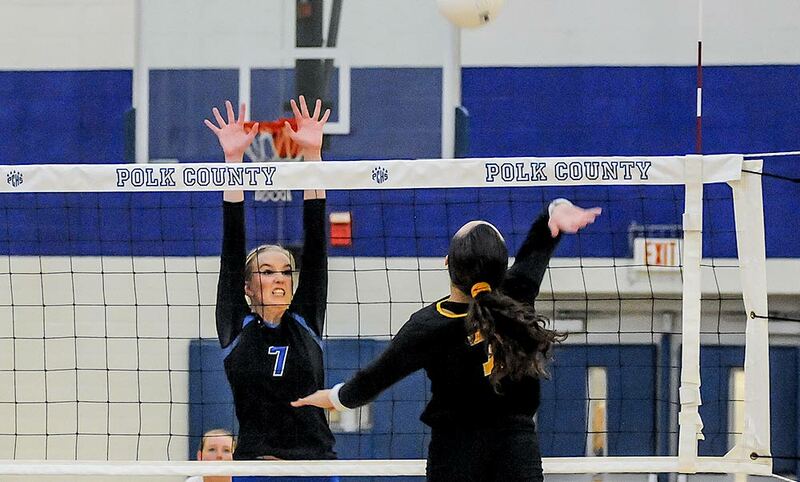 Polk County earned its first win of the season Wednesday, posting a three-game sweep of Pisgah in non-conference volleyball action in Canton. The Wolverines (1-2) rolled to a 25-19, 25-18, 25-23 victory over the Bears, who dropped to 1-1. Sydney Waldman had 24 assists, three blocks, three aces and eight digs for Polk County, with Grace Lauer adding 10 kills and four digs and Mireya Roman notching eight kills and a dig. Kristen Hall also had eight kills with 12 digs and an ace, with Ansley Lynch recording 14 digs, a kill and an assist. In junior varsity action, Polk County improved to 2-1 with a 25-13, 25-14 victory. Emmie McDowell had nine assists, five aces, three kills and two digs for the Wolverines, with Rachael Davis posting three kills, four digs and an ace. Rollins Carter had nine digs and two kills and Kylee Mullis had four aces, two digs and a kill. Both Polk County teams are next in action on Tuesday, hosting West Henderson.